Barcelona may be famous for its famed soccer club but soccer is just one thing on the list of so many things the city excels in and offers. The city offers excellent aesthetics and there are so many reasons to love the city from its great architecture and galleries, to awesome food and music. With the abundance of historical and cultural artifacts, Barcelona is just about as romantic as another wonderful city of Paris. It’s certainly the city one ought to move to, if they are considering settling overseas. Here below are the 20 reasons as to why Barcelona is an amazing place to live. After reading these reasons, you’ll have plenty of inclinations to move to this wonderful Spanish city. Barcelona may be a quite big city but the size is perfect to discover on foot. There are plenty of things to discover as well. There’s abundance of great gastronomic options and the city also houses some of the most impressive parks and buildings. If you don’t feel like walking, you can even turn to bicycles to discover the city through stunning routes. You can find great architecture almost everywhere in this city, a paradise for architects. There are awe-inspiring Gothic basilicas put side by side with magnificent modern-day buildings. Most of the city’s architectural wonders have been designed by the famous architect Antonio Gaudi. 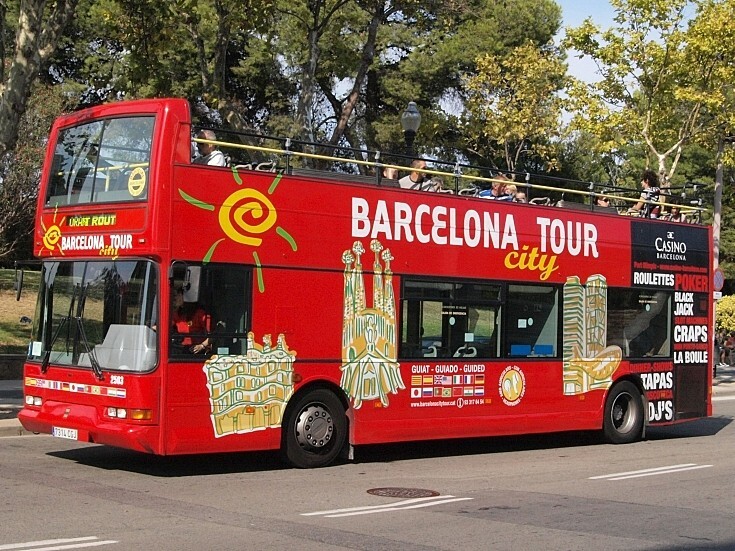 Some of the finest monuments of the city are Sagrada Familia, Park Guell, La Pedrera and Casa Batllo. You’ll fall in love with this city very soon especially if you’re a connoisseur of great food. There are excellent restaurants all over the city. The city loves to dine so much that most businesses and offices close two hours a day just to take lunch. The city boasts the freshest of seafood in the world and pastry shops are plentiful. You should be a happy person even if you do nothing but eat in this city. Barcelona has a fair share of live music venues like Apolo and Razzmatazz and magnificent concert halls like Gran Teatre del Liceu and L’Auditori. The music scene of the city is diverse, encompassing musical genres from classical to jazz to world music. The city also hosts some of the biggest annual musical festivals of the world such as Primavera Sound, Festival Internacional de Jazz de Barcelona, Sonar and Cruilla. This beautiful city also offers plenty of delight for lovers of chocolate. 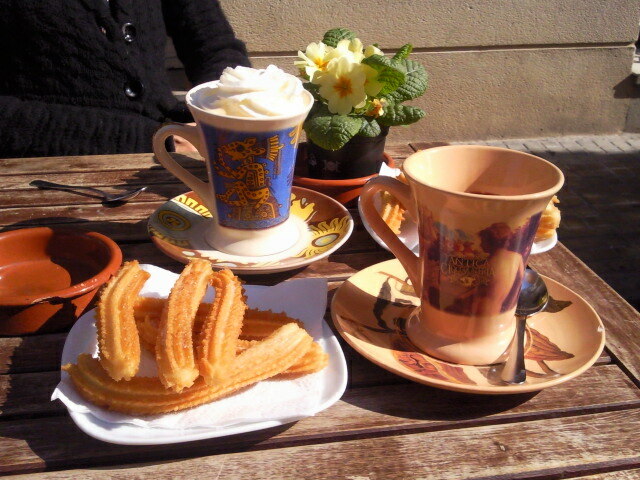 Some of the best chocolates in Barcelona are chocolate bon-bons and xurros con chocolat (a kind of hot chocolate). The city gave birth to Antoni Escriba, who is famous for being the “Mozart of Chocolate”, and if you ever stop by this city, you ought not to miss his pastry shop. 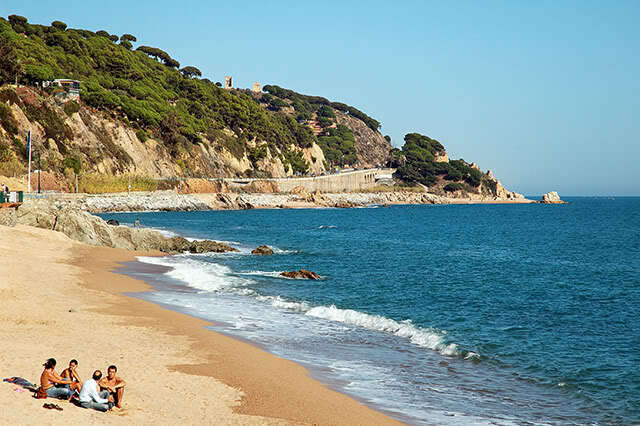 Another reason to love Barcelona is the presence of outstanding beaches. Sightseeing is great along these beaches. The climate of the city is generally warm and the beaches are nice and clean. The beaches are swiftly reachable and one can always turn to the beaches to relax after a hard day’s work in the city. Although you need to do a bit of legwork to reach the top, the magical Montjuïc is a perfect place to wander to. It’s a bit less populated by tourists but that’s not because it’s not worth seeing but because not every tourist wants to embark on an adventure. In fact, the mountain offers excellent views, with natural backdrops and excellent vistas all around. Coffee aficionados are just another kind of people, on the long list of the types of people the city of Barcelona can appeal to. 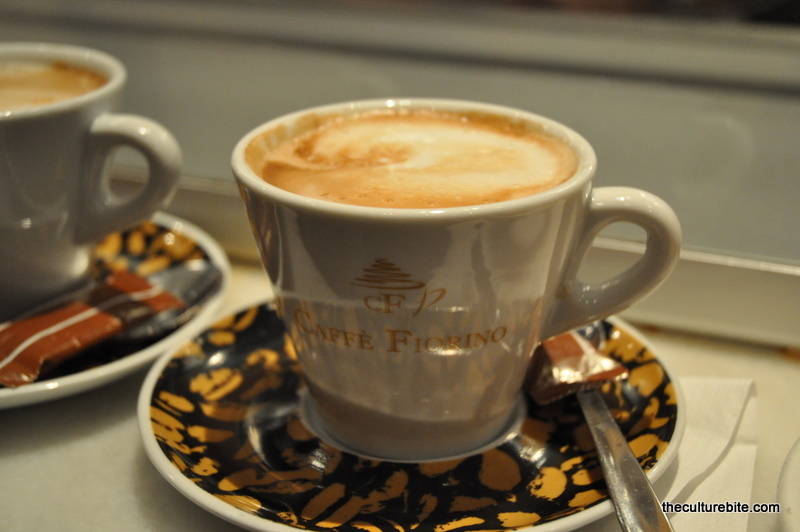 You’ll get to drink something as perfect as café con leche, which is the coffee halved with steam milk. The beverage is always smooth but never harsh nor bitter. An international city in every way, at Barcelona, with every step you take through the streets, you’ll always stumble upon something historically significant. To get a quick glimpse of the city’s history, you should visit Museu d’Historia de Barcelona, where the historical city heritages have been preserved and put on display. There are so many historic artifacts inside this museum, with Placa del Rei, Temple d’August, Born Centre Cultural and Museum Maritim to name a few. Spanish Wine and Cavas rival French Wine and Champagne. In fact, Cavas, or sparkling wine, is Spain’s answer to France’s champagne. The wine isn’t very expensive as well although the quality is exceptional. You can buy a bottle between five to ten dollars. Barcelona is surely the place to be at for lovers of wine and beer as it’s cheaper to buy these liquors than to buy a can of coke or a bottle of water. Style can be bought in this city at all kinds of prices. You can go for the rather expensive Spanish brands recognizable at the international level or for confined Barcelona brands. But if you go with the cheaper ones, it doesn’t mean that you are compromising much on quality at all. Some of the local and affordable brands in Barcelona are Zazo&Brull, Cuervo Cobberblack Bird (where you can buy handcrafted shies), RooM and Syngman Cucala. There are plenty of carnivals hosted by the city every year. These carnivals showcase rich Catalan culture, dazzling displays of fireworks, air shows, concerts and children acts. Festes de la Merce, which is celebrated in the month of September is the largest carnival in the city. It originally started as a religious parade but now, it’s one of the major reasons to visit the city. Every neighborhood in the city has its own chief celebration. 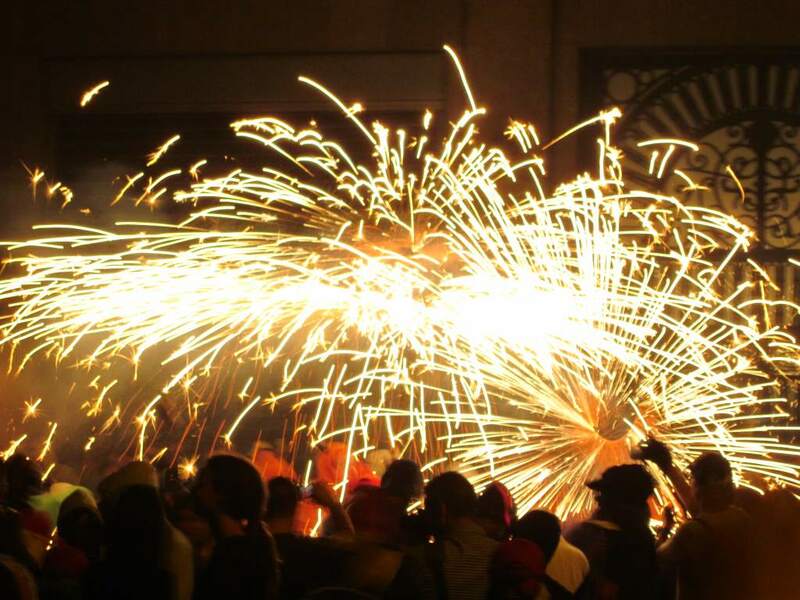 Among them, the celebrations of the neighborhoods of Gracia and Sants are the biggest ones. The city is home to plenty of nightclubs. We often think of Flamenco dancing whenever we think of Spanish dancing. However, Flamenco dancing is native to the Andalusia region of Spain and Barcelona has its own historic dance form in Sardana, performed at tablaos, which have come to prominence since 1960s. 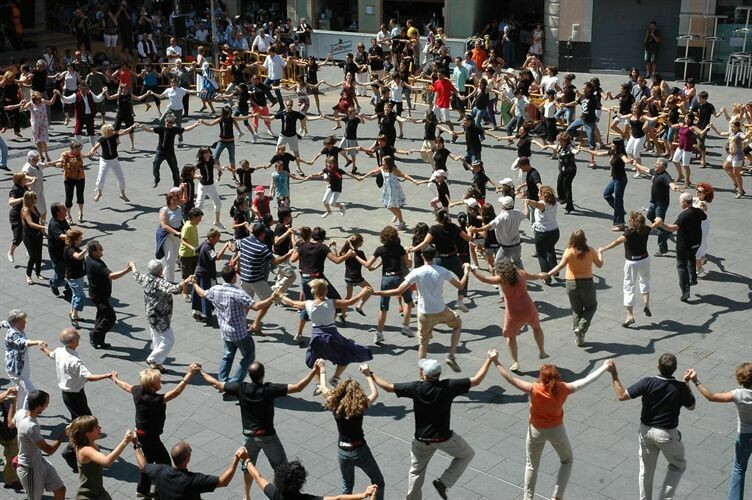 Sardana is performed on weekends in front of the Cathedral and City Hall. If you don’t like to flow in the tide of Valentine’s Day, coming every year with so much noise and almost always leaving you barren, the city offers you with an excellent alternative. Diada de Sant Jordi, or Saint George’s Day is celebrated on April 23, the day on which men give a rose to their darlings and ladies give them a book. This sweet occasion has kept Valentine’s Day pretty much at bay. Art is everywhere on the streets of Barcelona and it is beyond graffiti. Even the store shutters on the streets are gaudily painted. As mentioned earlier, the shops, as do other businesses, close mid-day. Reopening times of those shops vary. If you are able to take a few strolls about the city during the time the shops are closed, you’ll have the best view of street art. In spite of being a very big city and a major financial center of Europe, there are plenty of opportunities to revel in pastoral surroundings in the city. Some of the neighborhoods like Gracia, Les Corts and La Barceloneta in particular exhibit that candid and pristine rural aura with amply of native customs and festivities. You thought Chinese were the only folks who love Ping-Pong so much. How wrong you were! 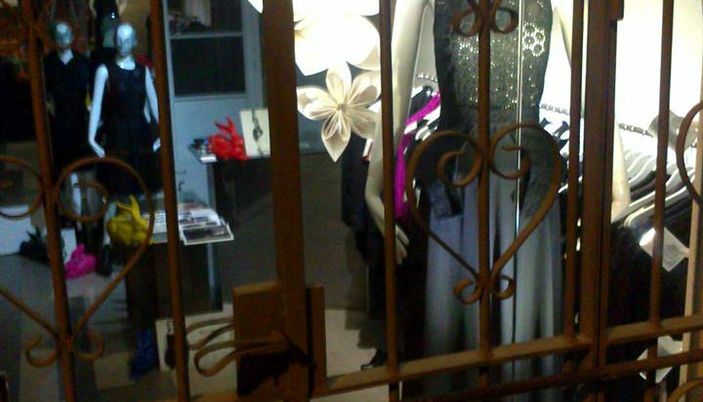 You don’t have to move a distance to find the next free Ping-Pong table in Barcelona. Scattered around the public places of the city, Ping-Pong tables provide you with ample opportunities to swing your paddle with opponents, provided you have one. It was mentioned earlier that this city offers excellent routes to discover the city through bicycling if you don’t feel like walking. But this deserves a point of its own as another great prospect the city can offer. Barcelona is as perfect as it can get for bicycling. The scenery is great, which adds to the fact that the city has heavily expanded network of bike lanes and fleets. The only problem is that the city is a heaven for bicycle thieves as well. 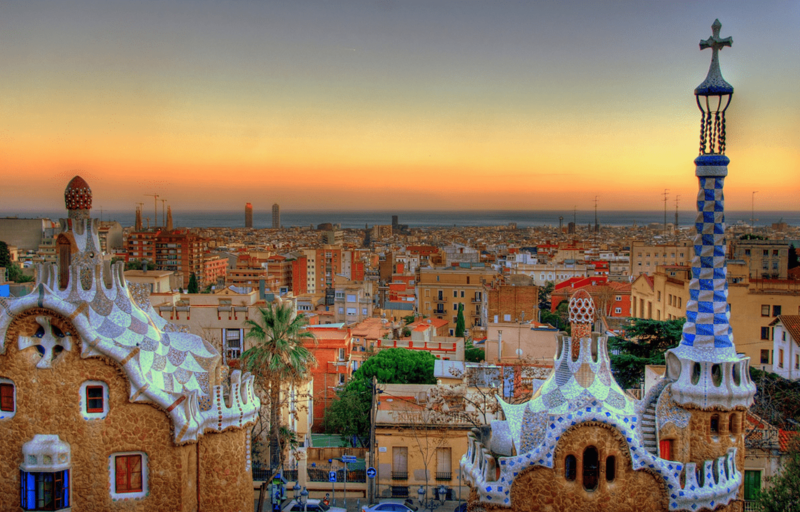 With myriad of equally rewarding options, Barcelona should be one of the easiest cities to discover. It was already discoverable on foot and bicycling possibilities were excellent. A very good public transport system takes discoverability of this city to further heights. There are so many options to get around the city with efficient buses, subways, trains, cable cars and funiculars. Lying in the Mediterranean region, the temperature of Barcelona is fairly moderate. With its poised climate, the city offers excellent living conditions throughout the year. The weather is predictable and rainfall is also quite balanced. You can enjoy months of unbroken sunshine without ever having to feel the agony of a scorching heat of the Sun.